WTF Are You Reading? : Under the Never Sky...A Shining Star of a Read! In recent years it has become increasing difficult for YA authors to distinguish themselves from the pack due to the growing number ingenious plots and growing stable of fascinating characters that seem to pop up like dandelions in spring grass. One author who has managed to not only distinguish herself, but to pull ahead of the pack is Veronica Rossi. 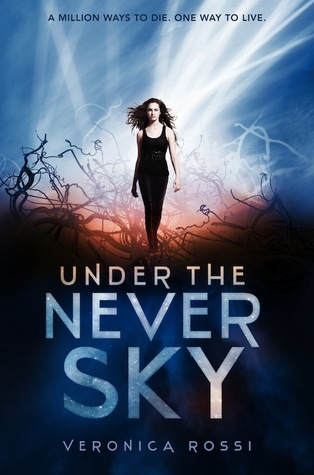 Her book "Under The Never Sky", a dystopic masterpiece of the highest caliber. The secret to Ms. Rossi's genius is her ability to make the characters tangible to her audience. The smooth and elegant writing style employed by its writer, achieves a perfect balance between story, setting, and characters; allowing each element to shine alone when called upon or to blend seamlessly into a panoramic whole. The first people that we meet live beneath the dome of a community called Reverie. This community is very closed, both from within and from without. Afraid to even breathe the outside air, the people of Reverie prefer to live their lives in the VR world of The Realms. Life in the beneath the dome is a very grey and sterile affair. Human touch and personal contact outside of The Realms is almost unheard of. In sharp contrast to the muted pseudo-world of Reverie; there is the loud tactile vibrant, and very dangerous world of the Outsiders. Theirs is a world fraught with violence, storms, sickness, death and fear. Aria will soon discover that it is also a world of wondrous sights, awe inspiring sounds, life-changing experiences, and heart-stopping love. The first thing that you will notice about the relationship between Aria and Peregrine is the lack of INSTALOVE! They are much too busy trying to survive fires, cannibalistic tribes, and killer atmospheric storms for too much hand holding kissy kissy to be going on. In fact there is so much action coming at these too for so much of the book, that by the time things do settle enough for them to breathe, the romance is a sweet surprise. This is a very fast paced adventure full of strong, well rounded characters, varied and interesting settings within a mind bending world, plot twists that have to be read to be believed. Loved this book! Cannot wait to read Through the Ever Night! This is currently on my TBR list:) Thanks for the great review! I'm dying to read this one! Looks great and I love dystopians. I've had a copy of this for AGES and have got to read it! Great review, especially loving the lack of insta-love because it bugs the feck out of me. This is one of my absolute favorite books. I like dystopians, but only rarely. This one, I loved. I love the characters, the world. I love everything about it. I can't wait for Through the Ever Night!